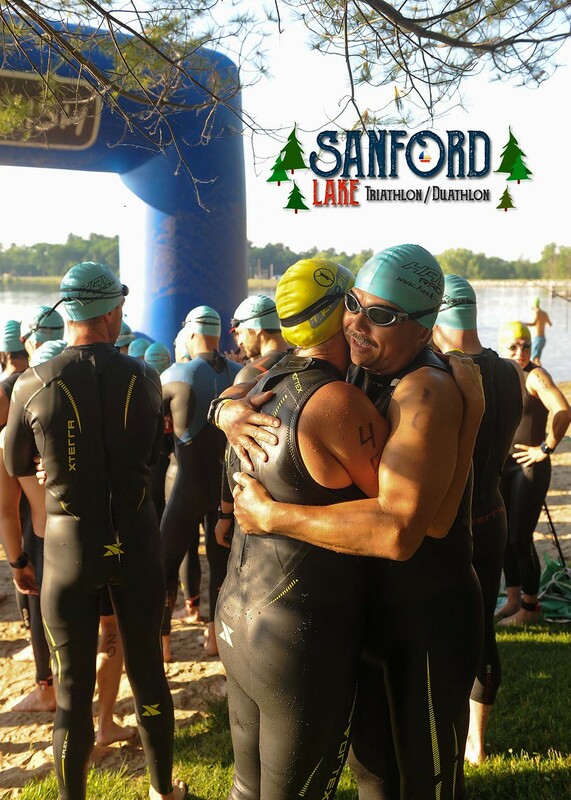 Join TRITOFINISH at beautiful Sanford Lake Park in Midland County for the 4th Annual Sanford Lake Triathlon! This event is special to us as we are based right here in the Great Lakes Bay Region and with a Super Sprint Triathlon event being part of it, we are able to encourage a whole new group of athletes to Tri! With over a half-mile of lake frontage and 1000 feet of soft, sandy beach on the shores of Sanford Lake, this popular recreation area is a wonderful spot to nurture that golden tan and enjoy the sun. It also makes for a pretty sweet Triathlon venue! And by having this race in June, the swim should be free of weeds and ideal for all those newbies looking to compete in their first triathlon. This race is for both the seasoned athlete AND anyone looking to “test the triathlon waters”. Olympic, Sprint, Super Sprint and Sprint Duathlon are all on the agenda. Unable to participate in all disciplines? Get a team of 2-3 together and compete in a relay! However you choose to participate, we look forward to seeing you at the Finish line. See you in June! Swim – A triangular, single lap course with athletes swimming clockwise. Bike – This is an “out and back” bike course. Athletes will exit the park and immediately turn left onto Smith St where they will ride a short distance before turning right and heading West on Saginaw Rd to their event-determined turnaround point. They will then Turn around and head back the way they came on Saginaw Rd before heading East back to Smith St and to transition in the Park. This is a FLAT, fast course. Run – Athletes will exit the park through the main entrance and will turn left onto Smith St where they will head South until crossing Saginaw Rd and turning left onto the Pere Marquette Rail Trail. Athletes will then stay on the rail trail until reaching their event-determined turnaround points and will return to the park along the path from which they came. Flat, fast and scenic with a great view of town! There is ample parking at several lots in the Sanford Lake Park area. NOTE: The park charges a $6 Fee per vehicle entering. Those picking up packets or registering late on-site Saturday will receive a ticket allowing re-entry at no additional cost on Sunday. Event-specific T-shirts are guaranteed ONLY to those who register online before Noon on Friday, June 17th! All registrants after that date/time will be provided with a TriToFinish t-shirt if event-specific shirts are unavailable on site. Ladies cut shirts are offered for this event, but ladies are NOT required to order them. Note that Ladies cut shirts are smaller and more form fitting than the unisex shirts. Please order accordingly. TriToFinish is committed to making this a memorable event for participants. Every finisher from first to last will enjoy an exciting finish line, a high quality event t-shirt and a custom finisher medal. AGE GROUP Awards will be provided 3 deep for the Olympic, Sprint and Sprint Duathlon events. Award presentation for each event will begin ONLY after the last participant in that event crosses the finish line (or once event cutoff time has been reached). Participants MUST be present to receive Age Group Awards*. * We apologize for any inconvenience this presents, but we truly believe that each Multisport Event is exactly that: an EVENT. Age Groupers finish at different times throughout races. It is unfair and unsportsmanlike to begin ceremonies for which a participant may be eligible for an award if that participant has not yet reached the finish line. Please be courteous of and encouraging to fellow athletes. * Online Registration closes at Midnight, Thursday, June 20th, 2019. After that, ALL registrations will be completed on-site at late registration/packet pickup at the increased rate.